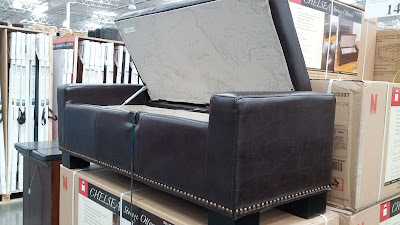 I had been using the Noble House Chelsea Storage Ottoman primarily as storage and extra seating, very handy during parties. But with a toddler in the house, the ottoman is more for storage for his toys now. 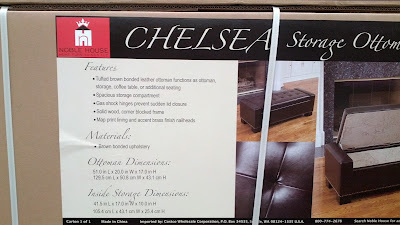 So as you can see, the Noble House Chelsea Storage Ottoman is multi-functional and can be useful in any home. You can store extra pillows and throw blankets in it. I especially like the gas shock hinges so that the top of the ottoman doesn’t just slam onto your fingers when closing. 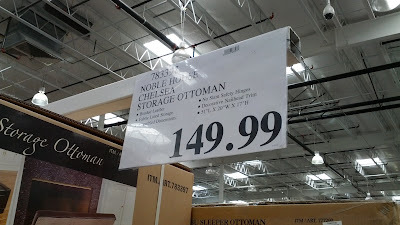 It is plenty big for my use with its inside storage dimensions of 41.5 in L x 17 in W x 10 in H. Go check out the Noble House Chelsea Storage Ottoman for yourself and see if the color, size, and functions meet your needs. Noble House Chelsea Storage Ottoman. Noble House Chelsea Storage Ottoman With Gas Shock Hinges. Noble House Chelsea Storage Ottoman with Traditional Map Printing. The Noble House Chelsea Storage Ottoman features bonded leather and is brass-studded. It can function as an ottoman, storage compartment, coffee table, or additional seating. The gas shock hinges provide soft-action closure. The map print lining and brash finish nailheads give it a classy, professional look. Inside storage dimensions are 41.5 in L x 17 in W x 10 in H.